Robes that hide stomachs and veiny legs. Wings that take you wherever you want to go, with no security line hassles. Then of course, there are angels who don’t wear the standard garb. Angels, who appear with invisible halos, to help a girl out. What’s the kindest thing a stranger ever did for you? What’s the kindest thing you’ve ever done for a stranger? I’m realizing now, that in the menopause journey, I shrank into myself, some. I became less outgoing and less willing to extend myself to strangers. Only recently did I, a people lover, figure out this had happened. But you can’t be an angel, even a sometimes angel, if you hide inside yourself. But I’m back at it. I revved up a bit on a flight home from Baltimore yesterday. When the plane landed, the woman next to me thanked me for chatting. She and her mom were flying from Dayton to visit a sister/daughter in North Carolina. Usually, I barely speak on a plane unless spoken to, as I’m fearful I will lose my reading time. My seatmate ended her thank you by saying that her mom hadn’t flown since 1968. Granted I was a tiny angel, but I like to think the mom, who had a long day, found the skies friendly in 2013, in part, because of our conversation. Did your flight into menopause make you more outgoing or did you turn inward? If you turned inward, any plans to spread your wings again? 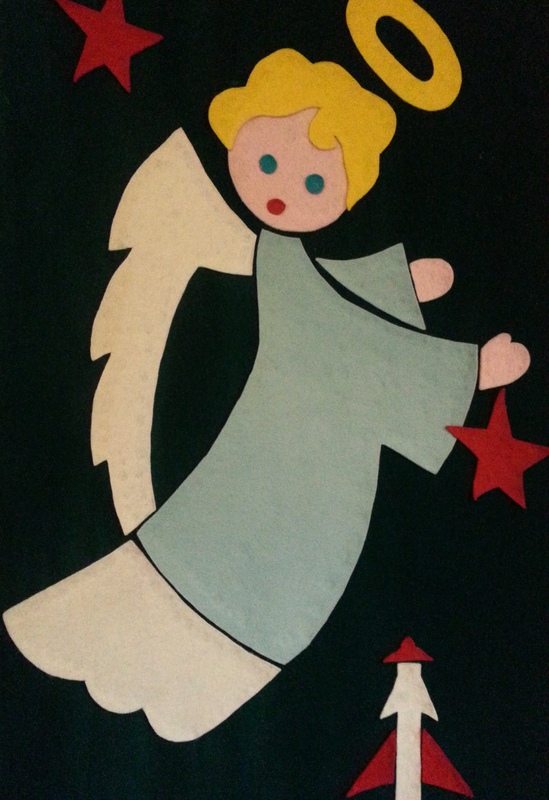 Christmas Banner: My mom, Nancy Kiehne, made the angel banner in 1965 for Divinity Lutheran Church. The rocket is a nod to the space program, which was in full swing. I did not turn into an Angel with menopause but I do talk about it and am not in denial. Angel wear as you describe could be a whole new fashion niche!